Open Day | Music Matters | Because it does. Doesn't it ? 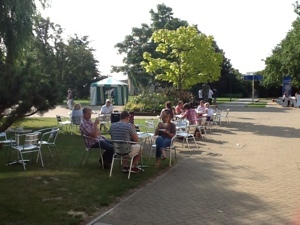 Despite the twin threat of soaring summer temperatures and the quarter-final match as this year’s England football squad edge ever closer to the World Cup Final, last Saturday’s University Open Day brought visitors aplenty both to the Canterbury campus as well as to Colyer-Fergusson. Amongst the visitors filing through the doors of the music building were people from Somerset, Devon, Northamptonshire, Surrey, Hertfordshire as well as from London and Kent itself; however, the prize for the Visitor from the Farthest-Flung Shore went to a lady from Paris. 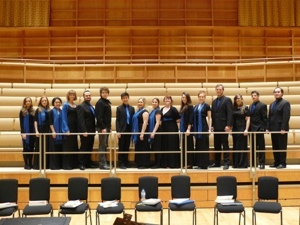 Thanks to some of our loyal Music Scholars and student ambassadors (pictured above), who took the time to lead tours of the building and its facilities for extra-curricular music-making, sharing their experience of combining their academic studies with their musical life, and to Fleur, President of the Music Society for the next academic year. 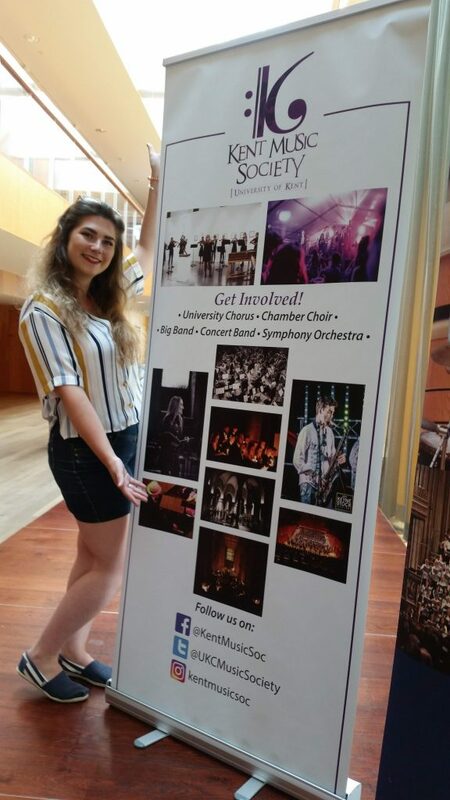 It’s Open Day today, and we’re here in the Colyer-Fergusson Building until 3pm; if you want to come and look around the concert-hall and practice facilities, find out about all the music-making that takes place at the University, or want to know more about our Music Scholarships – come and say hi! 11am; we’ve seen visitors from Canterbury, Buckinghamshire, Vienna and Munich so far this morning, testament to both the local and international appeal of the University! 12.30pm ; the record for the Visitor-from-the-Farthest-Flung-Shore award appears to be going to the most recent visitor to the music building, who has come from Singapore: welcome! If you’re coming to the Postgraduate Open Day event this Saturday, by all means drop in to the Colyer-Fergusson building and hear the University Chamber Choir, which will be in the midst of its all-day workshop. The rehearsal lasts from 10am to 3.30pm; come and get a sneak preview of what’s to come in the concert on Friday 15 February. You can find out more about the Postgraduate Open day, which runs from 10am-2pm, online here. Here we are again at the #kentopenday, the October session for those who missed the mid-week one last month. 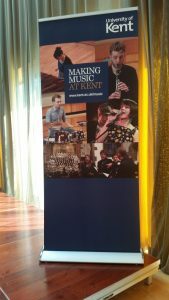 As usual, we’re ready at the ‘Making Music’ stand (once again in Eliot College Hall), to let visitors know about all the music-making activities taking place at Kent this year. Follow us on the blog and on Twitter as we progress through the day. 11am: fourteen visitors to the stand so far; and the VfF-FC competition is currently being held by a lady from, well, California, although she is currently living in Brighton – we’re hoping Hannah in SSPSSR will allow us that one ?! 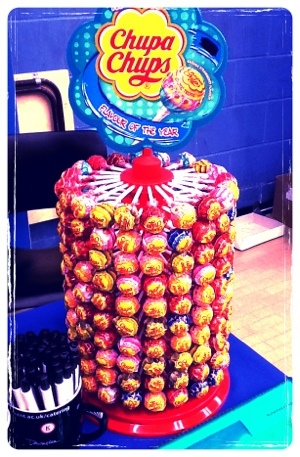 We’re at the ‘Making Music’ stand at #kentopenday today. In a change to our usual spot, we’re in Eliot Hall throughout the day, greeting visitors to the campus who want to find out more about making music at the University, music scholarships, and the brand-new music building (the hoarding around the outside started to come down yesterday, and it’s looking very exciting indeed: pictures to come tomorrow, I hope!). We’ll be keeping you posted as to how we’re getting on throughout the day both here and on Twitter as well. 10.15am; just over an hour since we started, and we’ve see about ten people already; the usual prize for the Visitor from the Farthest-Flung Corner is currently held by someone from Nottingham. Quite a few string-players too… and the coffee is going well. 2pm and we’re into the last hour; a trickle of visitors over lunch means we’ve now met over thirty people. I popped out earlier to take some photos of the exterior of the building, as all the hoardings have now been taken down (they’re on Twitter if you want to view them), which is particularly exciting a milestone to reach: the end is in sight! 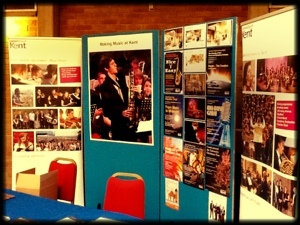 It’s that time of year again: we’re here once again at the ‘Making Music’ stand for the University’s Open Day. 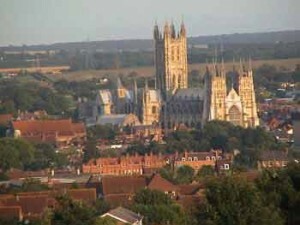 We’ll be live on Twitter, keep up with all that’s happening at @UniKent_Music as well. We’ll be reporting live from here throughout the day, follow it all on the blog here. 11.30 and there seems to be a trend of visitors interested in music alongside degrees in History, Law and English. Although not all three at the same time, I should point out. Quite a few saxophonists, too; perhaps I should warn the conductor of the Big Band that, come September 2013, he may well have a Very Big Band on his hands. 12.30pm and the prize for the Visitor from the Farthest-Flung Corner goes to Gabrielle, who has travelled from Belgium: welcome! Still trending on Historians. A visitor from Bath, sadly just pipped to the post for the VF-FC award by Gabrielle: condolences! 2pm and we’re into the final hour, having taken advantage of an ever-so-slight lunchtime lull in visitors to grab sandwiches while we could. 3pm: and that’s it for the day. Over fifty visitors finding out about all the musical activities that happen as part of the student experience at Kent; lots of interest too in the new music building which will open its doors this autumn. A wide spectrum of musical tastes and interests, including lots of interest in jazz; I can see Jazz@5 becoming a regular feature from September 2013 onwards if all theses interested come to Kent! Thank you to all who attended throughout the day, safe travelling back home. 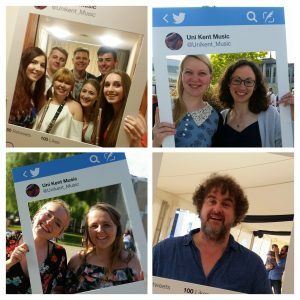 It seems but scant moments ago that we were here at the music stand at the University’s Open Day; checking back, I see it’s been about four weeks since last we were here; how time flies when you’re busy getting music together at the start of the academic year! I walked across to the Sports Hall this morning at 8.30 to set up, accompanying a chap who was coming to the Open Day; he’d come straight from working a night-shift directly onto the campus to come and find out about courses of study in IT: now that’s dedication – hats off to you, sir! It’s now 9.30am, and we’ve already had two visitors to the ‘Making Music’ stand asking about choral and piano-playing opportunities. We’ll be reporting live from the stand throughout the day – and on Twitter – keep up via @Unikent_music. 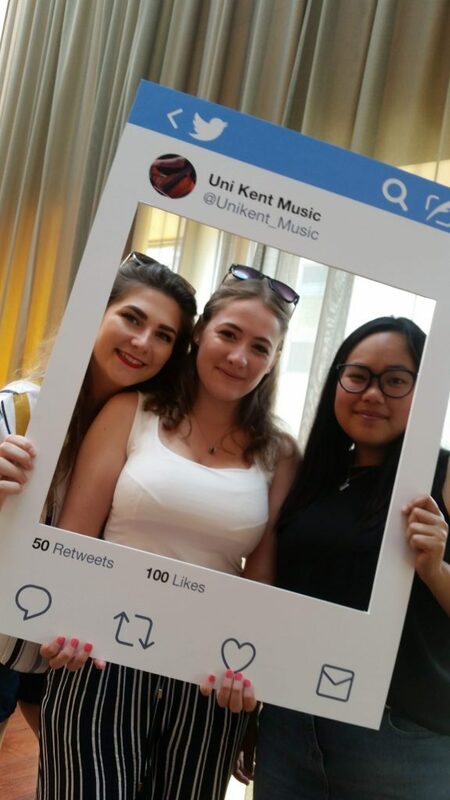 New this time are live updates from the University on Twitter (or via text) from @UniKentLive; follow them for live updates and assistance throughout the day! 10.20am; our usual competition for ‘Visitor from the Farthest-Flung Corner of the World’ has had a strong contender with someone coming from Spain. Nine visitors so far…. 12.30pm: we’re now up to thirty-five visitors: no further challenges to the ‘Farthest-Flung’ competition, although a tip of the hat to visitors from Bath and Torquay! A variety of singers and instrumentalists coming to the stand. When’s lunch ? 2pm: heading into the final hour of the day, I notice the Twitter-trending on #kentopenday is keeping the Twitterverse busy, lots of reaction to today’s events from visitors. Visitors from Southampton, Yorkshire, Staffordshire, Hertfordshire and elsewhere having been keeping the music stand busy. 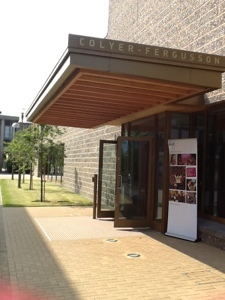 Lots of awareness of, and interest in, the new Colyer-Fergusson music building and the opportunities to use it when it opens net summer. And we’ve not even finished the ‘Revels’ that we opened at 10 o’clock this morning: that shows you how busy we’ve been. I wonder if there’s a recognised system for measuring levels of industry by the amount of sweets that have been unconsumed ? 3pm: and that’s it! Good to see so many people interested in making music at the University from September next year, save travelling home, we look forward to seeing you in the new music building!